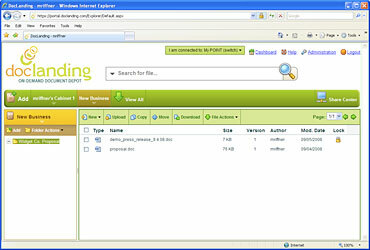 Are you looking for a host which can provide you secure upload and sharing important files through the web? You may consider DocLanding. DocLanding is a secure platform and online document depot for you to upload important documents or files. With this service, you can access them at anytime and anywhere as long as you able to login to DocLanding. Additionally, you may also have someone to review or update your files without connect to your company’s network to access the files. It is easy to use and features with organizing tools that allow you to organize the documents or files in file cabinets and folders. So that you can easily manage your documents online without mssing. Easily share or unshare the documents and file cabinets at any time. Black-out sensitive worlds and phrases in confidential documents. Prevent original documents from being altered by using watermarks. Able to preview many file types without the need of other software. Secure powerful document management online. Now it is free to sign up for 256 MB storage space.